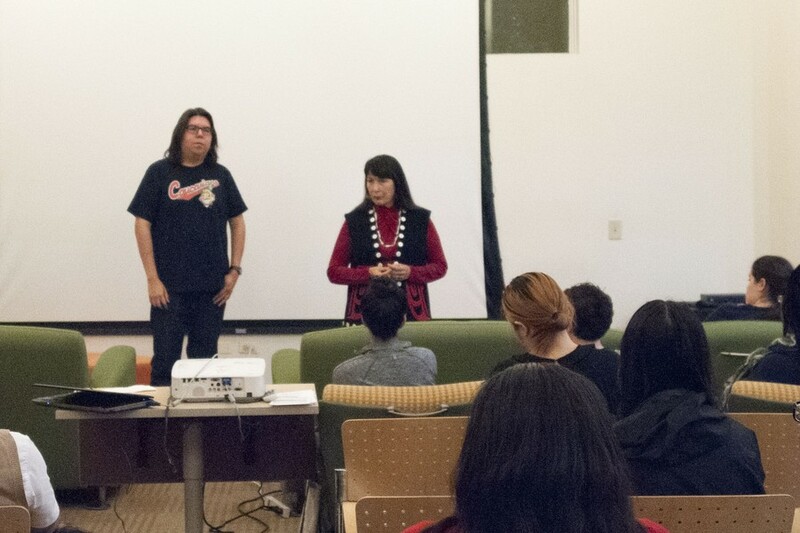 In the midst of the recent controversy surrounding the Washington football team, Charlene Teters, a Native American artist, professor, and lecturer, attacked American Indian sports mascots as demeaning. Her Columbus Day talk, sponsored by the Office of Multicultural Student Affairs, was accompanied by an abridged screening of the documentary In Whose Honor? : American Indian Mascots in Sports, which follows the story of her early protests against the mascot of the University of Illinois at Urbana-Champaign (UIUC), Chief Illiniwek. Teters, an alumna of UIUC, grew up in a traditional American Indian community near a reservation in Spokane, Washington. After arriving on the central Illinois campus, she took her children to a basketball game that featured Chief Illiniwek dressed in traditional American Indian clothing. Her immediate response was to feel angry and caricatured. Both Teters’s talk and the film spent a significant portion of time focusing on how her protests caused division in the community. When she began picketing the mascot, she said, several basketball players showed their support by marking the logo on their uniform with a taped X. By next season, it was written in their contracts that players were not to have a public opinion in the matter. In the film, several proponents of Chief Illiniwek defended his use as a mascot, citing tradition. Teters’s anger with Chief Illiniwek sparked her mission to end the use of American Indians and American Indian imagery as sports mascots and logos. Over the course of her advocacy, Teters has been ridiculed, beaten, and in 1998 arrested for protesting at a Cleveland Indians game. She is currently the president of the National Coalition on Racism in Sports and Media. “It’s been a real struggle to make people see why this issue is important,” Teters said. “The reason people don’t get [why this is offensive] is because we’re so invisible.” She added, though, that in the two decades since she left UIUC, her movement has picked up steam. “I think the film had a lot to do with sustaining the movement,” she said, speaking of the cultural impact of In Whose Honor?, which has won nine awards and was broadcasted internationally.